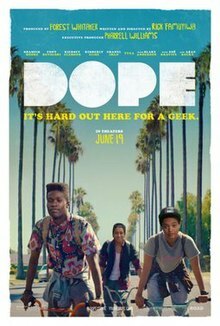 Dope is a 2015 American comedy-drama coming-of-age film written and directed by Rick Famuyiwa and produced by Forest Whitaker and Nina Yang Bongiovi. It stars Shameik Moore, Tony Revolori, Kiersey Clemons, Kimberly Elise, Chanel Iman, Lakeith Stanfield, Blake Anderson, Zoë Kravitz, and ASAP Rocky. The film was also executive produced by Pharrell Williams and co-executive produced by Sean Combs. The film premiered at the 2015 Sundance Film Festival on January 24, 2015 in Park City, Utah and was released in North America on June 19 by Open Road Films. It was re-released on September 4 during the Labor Day holiday weekend. The film received generally positive reviews from critics and was a moderate commercial success, grossing $18 million over a $7 million budget. Malcolm Adekanbi and his best friends, Jib and Diggy, are high school "geeks" living in "The Bottoms," a crime-frequent neighborhood in Inglewood, California. Malcolm is confident he will be admitted to his dream school, Harvard University, on his academic ability, but his school counselor berates him since their school is in a run-down suburb in Los Angeles. He suggests Malcolm take college application process more seriously, starting with an upcoming interview with businessman and Harvard alumnus, Austin Jacoby. While biking home, Malcolm is stopped by Dom, a drug dealer who instructs him to invite a girl named Nakia to his party. Finding him charming, Nakia tells Malcolm to reply that she will only accept if Malcolm goes. Despite initial reluctance, Jib and Diggy convince Malcolm to go and the trio arrives. During the party, Dom and his crew meet in a back room to buy high-grade, powdered molly but are interrupted by an armed gang, and several people are shot. Hiding behind the bar, Dom finds Malcolm's backpack and fills it with the drugs and a gun, giving it to Malcolm and sending him away while the police arrive. Nakia then drives Malcolm home when he offers her help for the GED. The next day, Malcolm discovers the items and an iPhone. Immediately, an unknown man calls, reveals that he knows Malcolm's identity and instructs him to turn over the drugs that day. After school, Malcolm begins to approach the car to hand over the drugs when he receives another phone call on the same iPhone. Dom, in custody, had called Malcolm to tell him not to give the drugs over to the other caller. He texts Malcolm an address and tells him to ask for AJ. Malcolm, Jib and Diggy flee to the address, while being chased by the unknown caller. They arrive at the address and are greeted by a young man named Jaleel and his sister Lily. Since their father, AJ, isn't home, Jaleel invites them inside his father's mansion and takes Jib and Diggy out for food while Malcolm stays with Lily. She seduces him, finds the drugs and takes a heavy dose. Meanwhile, Malcolm gets a phone call reminding him of the interview. Lily, intoxicated, drives him but passes out at a stop sign, who then runs out of the car and publicly urinates on a bush while bystanders record. Malcolm takes her car and drives to the meeting himself. Arriving at Jacoby's office, he notices photos of Dom, Lily and Jaleel in the man's office and realizes he is AJ. Malcolm relays Dom's instructions to Jacoby, who denies any knowledge and subtly indicates that the contents of the bag are now Malcolm's responsibility. Jacoby reschedules the interview - if the drugs aren't sold by then, Jacoby won't give Malcolm a good recommendation to Harvard. Low on options, Malcolm, Jib and Diggy seek help from a college student they met years ago, Will Sherwood. A stoner and hacker, he sets up an online black-market website to sell the drugs through Bitcoin transactions, which soon goes viral. Malcolm helps Nakia study, where she opens up to him. He then accuses her of being sent by Dom to gather info and pushes her away. The next day, Malcolm asks Will to extract cash from the Bitcoins, and arranges a meeting with a money-laundering gangster named Fidel. With the meeting going as planned, Malcolm leaves with a bag of cash but is assaulted by the school bully and company, quickly overpowering him and takes the bag. Desperate, he defends himself by pulling the gun, getting the money back and earning the bully's respect. Returning to AJ's office for his interview, Malcolm tells Jacoby that he has sold the drugs but has left a trail leading to Jacoby. Unless Jacoby admits him to Harvard, Malcolm will transfer the Bitcoins to Jacoby's checking account, which will frame Jacoby and lead to his arrest. He then types his college application essay. He describes two students – Student A is a music geek that plays in a punk band and gets straight As, while Student B suffers in the hood and makes money in immoral ways. He then asks, "Which student do you think I am?" Malcolm waits for Nakia at prom, but she does not show at all. Later, Nakia meets Malcolm at his home and thanks him for helping her pass her GED, giving him a pass to Six Flags and kisses him on the cheek. He then goes inside and enters his room to find an envelope from Harvard on his bed. He opens it and looks at the audience before smiling. Lakeith Stanfield as Marquis "Bug"
The soundtrack to the film, Dope (Music from the Motion Picture), was released by i am OTHER Entertainment and Columbia Records on June 16, 2015. Dope debuted in the U.S. Dramatic Competition category at the 2015 Sundance Film Festival, which started on January 22, 2015 in Park City, Utah. At the festival, the film received offers from at least six production companies and film studios before its rights were sold to Open Road Films (who will distribute the film domestically) and Sony (who will distribute the film internationally) for a reported $7 million plus $20 million for marketing and promotion. It was selected to close the Directors' Fortnight section at the 2015 Cannes Film Festival. In September 2015, the film competed in the 2015 Deauville American Film Festival where it won the Prix du Public (Audience Award). Dope grossed $6.1 million in its opening weekend, finishing 5th at the box office behind Jurassic World ($106.6 million), Inside Out ($90.4 million), Spy ($11.2 million) and San Andreas ($8.7 million). At the end of its theatrical run, the film grossed just shy of $18 million worldwide. Dope received positive reviews from critics. On Rotten Tomatoes, the film holds a rating of 89%, based on 150 reviews, with an average rating of 7.3/10. The website's critical consensus reads, "Featuring a starmaking performance from Shameik Moore and a refreshingly original point of view from writer-director Rick Famuyiwa, Dope is smart, insightful entertainment." On Metacritic, the film has a score of 72 out of 100, based on 37 critics, indicating "generally favorable reviews." According to CinemaScore, audiences gave the film an "A−" grade. The Guardian gave the film five stars out of five, describing the entire cast as "revolutionary." IGN awarded it 7 out of 10, saying "Comedy, romance, drama and crime rub shoulders in entertaining coming-of-age flick." ^ "DOPE". British Board of Film Classification. Retrieved June 22, 2015. ^ a b c "Dope (2015)". Box Office Mojo. Retrieved November 9, 2015. ^ "Pharrell Williams Shares 'Dope' Movie Poster". Radio.com. 2015-04-30. Retrieved 2015-04-30. ^ "Rick Famuyiwa Rides High with Critically Acclaimed 'Dope'". Atlanta Blackstar. May 19, 2015. Archived from the original on June 26, 2015. Retrieved June 20, 2015. ^ a b "Sundance Institute". Sundance.org. Retrieved 2015-06-20. ^ a b Chang, Justin (2014-12-03). "Sundance Film Festival Unveils 2015 Competition, Next Lineups". Variety.com. Retrieved 2015-01-28. ^ Han, Angie (September 1, 2015). "'Dope' Returning to Theaters". /Film. Retrieved September 1, 2015. ^ a b "Dope (2015) - Box Office Mojo". www.boxofficemojo.com. Retrieved 2017-05-12. ^ Fitz-Gerald, Sean. "The Details of Pharrell's Dope Soundtrack". Vulture.com. Retrieved 2015-08-16. ^ "The 'Dope' Soundtrack Is Awesome, Starting With This Hilarious Pharrell-Produced Song". Billboard.com. Retrieved 2015-08-16. ^ "Dope (Music from the Motion Picture) by Various Artists". Itunes.Apple.com. 2015-06-15. Retrieved 2015-08-16. ^ Kit, Borys (2015-01-25). "Sundance: 'Dope' Sells to Open Road, Sony". Hollywood Reporter. Retrieved 2015-04-16. ^ Fleming, Mike (2015-01-25). "'Dope' Movie Sells To Open Road & Sony After Big Sundance Auction". Deadline. Retrieved 2015-04-16. ^ "The Directors' Fortnight 2015 selection!". Quinzaine des Réalisateurs. Archived from the original on April 23, 2015. Retrieved 21 April 2015. ^ Mika SIMONNE. "AWARDS 2015". festival-deauville.com. ^ Elsa Keslassy. "Michael Shannon Starrer '99 Homes' Wins Deauville Grand Prize". Variety. ^ "Dope opening weekend". Box Office Mojo. Retrieved October 10, 2015. ^ "Dope (2015)". Rotten Tomatoes. Fandango Media. Retrieved March 2, 2018. ^ "Dope Reviews". Metacritic. CBS Interactive. Retrieved September 3, 2015. ^ Moylan, Brian. "Sundance 2015: Dope review – easily meme-worthy teen comedy". theguardian.co.uk. Retrieved 29 January 2015. ^ Singer, Leigh (May 21, 2015). "Dope Review". IGN.com. Retrieved June 20, 2015.